A few weeks ago, I shot an event at a Porsche dealership for a local PR firm. I stopped by the dealership a few days later and dropped off a CD for the Marketing Director. I handed the images on CD to Diane and she popped the CD into her PC. As the images were opening, Diane asked me about portraits. We talked a bit, I showed her a few samples on my Droid and she set an appointment for a consultation. 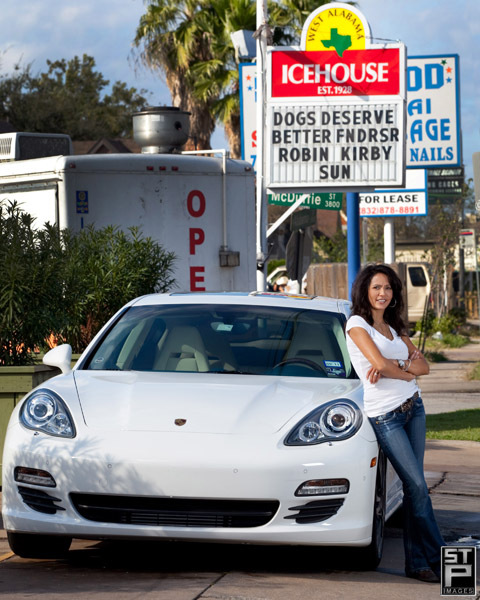 She wanted some outdoor shots with her new Porsche Panamera at the West Alabama Ice House and then some family portraits at the Menil and Rothko Chapel. We shot the session two weeks ago and Diane stopped by this past Friday night to proof her images. We had a blast during the proofing session and enjoyed picking her prints and products from her images. We can’t wait to get the canvas grouping, prints and greeting cards to Diane when they come back from the lab. I did promise her that I’d post a few images here. So, as promised, here are the images from Diane’s family session. Give them a glance and let us know if you’re ready to update YOUR family photos with something new, unique and eye-popping. We’d love to hear from you!